This is the third book I have read by Donald Miller. The other two are Blue like Jazz and Searching for God Knows What. I am a big fan of the way Miller writes. His books make me laugh and they also make me contemplate. He has a way of writing that makes it feel like you are having a conversation with him. This book is about growing up without a father and the affect that can have on your life. My father was an active part of my life, but in my line of work with youth at our church I run into kids who don't have an active father figure. So, I thought this book would have some valuable insights for me on a professional level. I was right about the valuable insights. There are a few statistics that are of interest but the best part about this book is hearing Miller talk about his thoughts on not having a dad around growing up. It's a good perspective to hear since I don't have a frame of reference for that kind of thing. 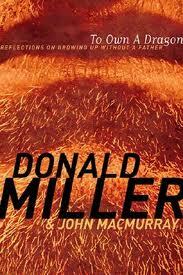 This book also talks about the struggles Miller had with accepting God as a father figure. I had never thought about that aspect of things before. I can see now how you would struggle with the notion of God as a father figure if you didn't have a good benchmark of a father in your own life. Throughout the book Miller talks about little things along the way in life that brought him a little closer to the idea of God as a father. It is a very thought provoking book. I would highly recommend this book to anyone that works with kids or has had trouble with father figures in their life. It is a great read and well worth the time spent.